You can't say that the City of Indianapolis isn't up for some new ideas. First, city officials selected a five-month old firm to manage a recently announced municipal partnerships initiative and now, they are asking the public to send in some new sponsorship ideas. 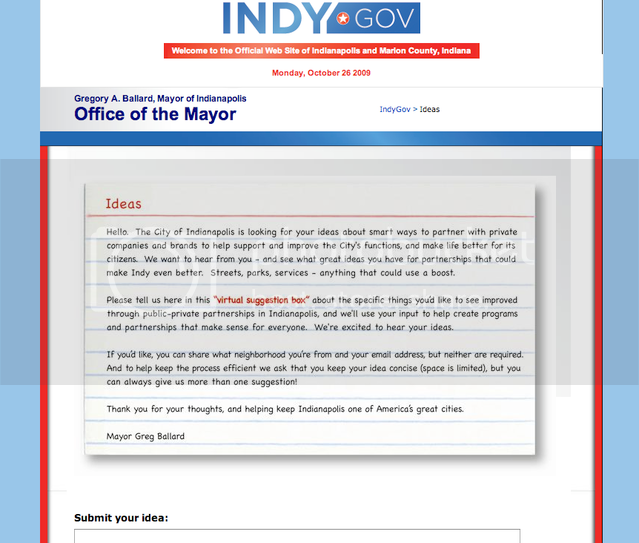 In line with Mayor Greg Ballard's emphasis on citizen engagement, Indianapolis has launched a rather unique action plan - part suggestion box and part focus group - for engaging the public in the selection process of appropriate corporate partnerships. "The City of Indianapolis is looking for your ideas about smart ways to partner with private companies and brands to help support and improve the City's functions, and make life better for its citizens. We want to hear from you- and see what great ideas you have for partnerships that could make Indy even better. Streets, parks, services - anything that could use a boost." Ideas will be evaluated by the City based on a number of factors, including public benefit, viability, sustainability, imaging for the City itself, and potential for incremental revenue. The second part of the plan involves forming a Neighborhood Association Council, which will help ensure that the Corporate Partnership Policy follows all applicable laws and establish guidelines for what is and is not appropriate as new ideas are brought forward. "No one knows this community better than the people who live in it, so we want to use this as a tool to reach out to individuals and give them the opportunity to share with us their ideas to improve city functions and overall quality of life for all citizens," said Mayor Ballard. Perhaps the upside of "inexperience" is curious ingenuity. Could other properties and agencies enlist fan or citizen groups in brainstorming new value-adding partnership ideas? "The Virtual Suggestion Box has been a big hit," Third Street's David Jones said. "In the first couple weeks after its launch we'd received a good couple dozen very smart and helpful ideas."